Lots of people celebrate things in December, not just Christmas. 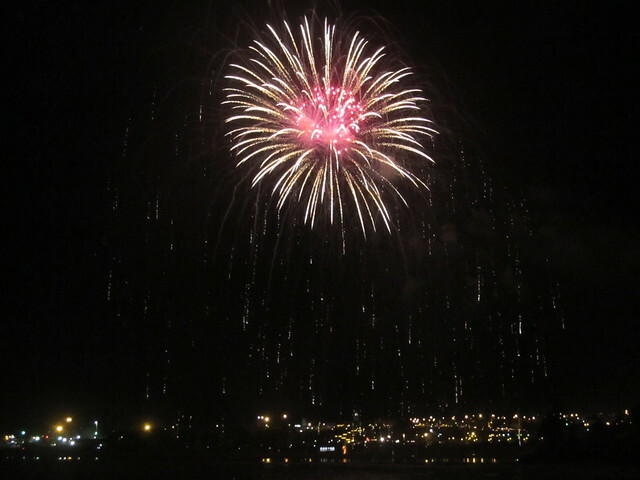 So images of your celebrations will be welcome - one image per week please. 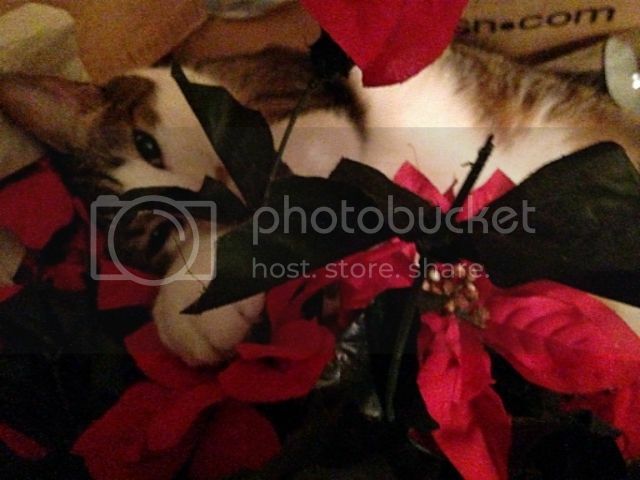 Quentin playing in his bed of fake poinsettias. He has loved them since I first got him on a June day several years ago & he found the Christmas decorations. Notice how some of the stems are missing the blooms. He loves to behead them and play with the flowers! When he as an itsy bitsy babe, he would run through the the house carry a flower in his mouth. He would often trip because the flower was bigger than his head and he couldn't see where he was going. This is Quentin from last week. I saved some of his pointsettia blooms from the house. Uh oh. I forgot this was once a week! Okay, no pictures from me here for two weeks. 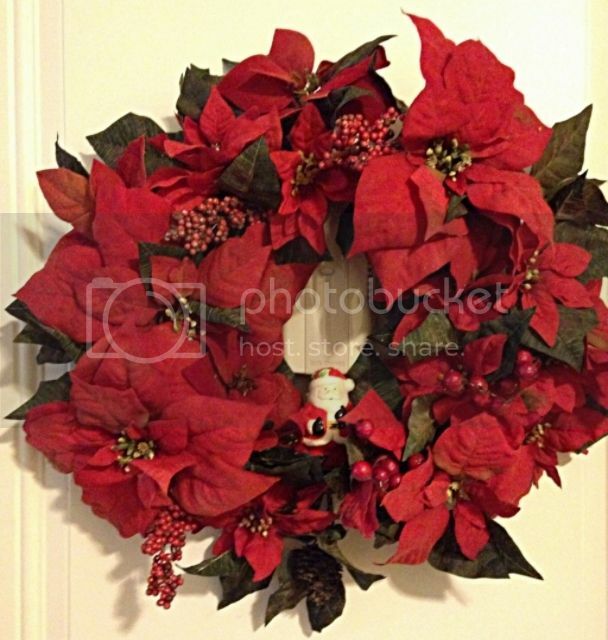 I had some fake poinsettia somewhere, I was just searching for it so I could make a wreath for the front door but can I find it? No. Now I know a cat must have destroyed it. Although not one of my cats, they only liked eating real plants. 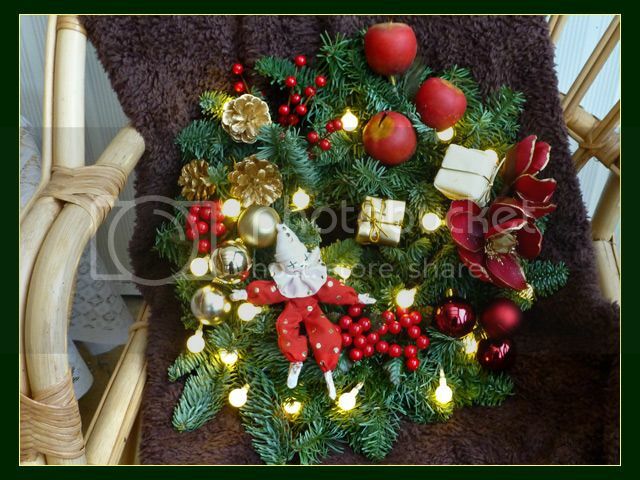 Anyway, I shall have to do without 'flowers' in the wreath or I'll have nightmares about the neighbourhood's moggies hurling themselves at the door to get at the poinsettia. 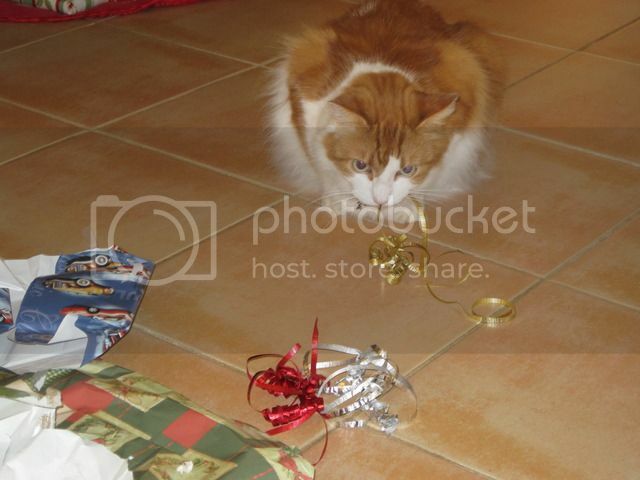 Crookshanks celebrates Christmas by chewing on the gifts and tinsel. The American military press publication, "The Stars and Stripes", has requested that a green light be shown in the 'Greenlight a Vet' effort to show support for American Veterans. 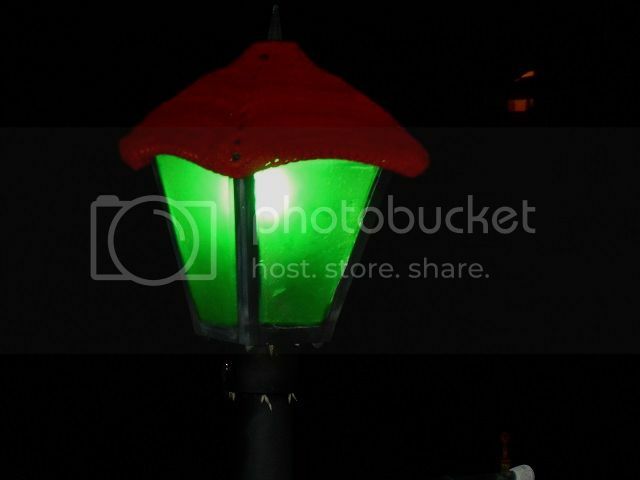 In my community the knitting league has through the years created red santa caps for our carriage lamps. I've added my 13 Watt green party curly que/CFL to my carriage lamp to go with the yarn chapeau. Nice job! Felice Navidad. Love the clown. Thanks, mehaul. I've had that clown for almost thirty years, I had to wire him securely in case some neighbourhood child takes a fancy to him! 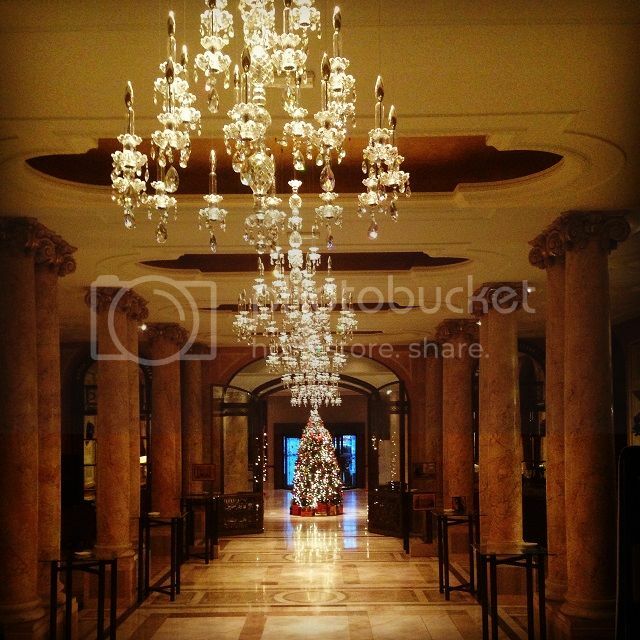 The lobby of the Hilton at Bucharest. 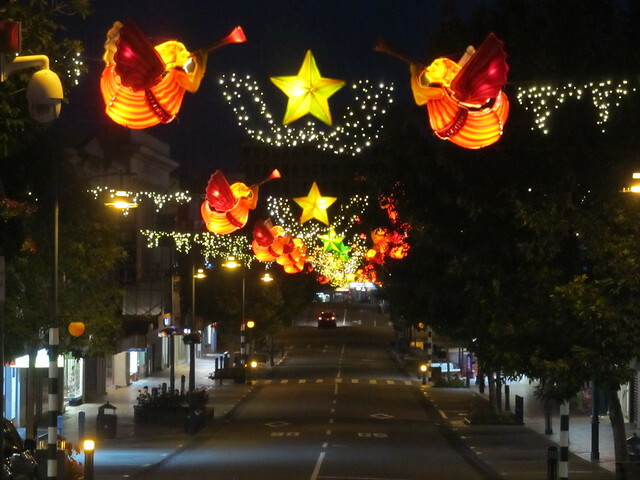 I like the Timaru decorations. So simple and yet so striking. This is the cake case at my local Publix Bakery. Lots of slimming cakes and cupcakes frosted in yummy icing and holiday motifs. After I took this shot, the Baker came over and hoisted the case front (doing away with those glary lamp reflections). She did this to turn the Christmas Tree one to face front. Hey, I didn't ask her to do that. All I did say to her was that it all looked beautiful and that she'd done a great job. Maybe tomorrow I'll return and purchase one. Any favorites? 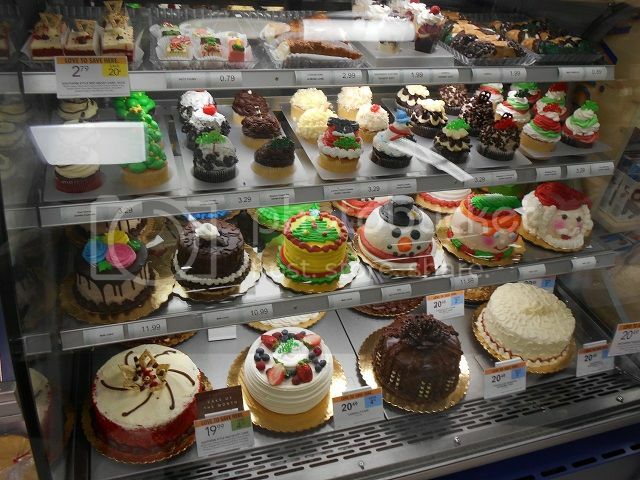 That chocolate one to the left of the Christmas tree cake looks like a steal at $10.99. 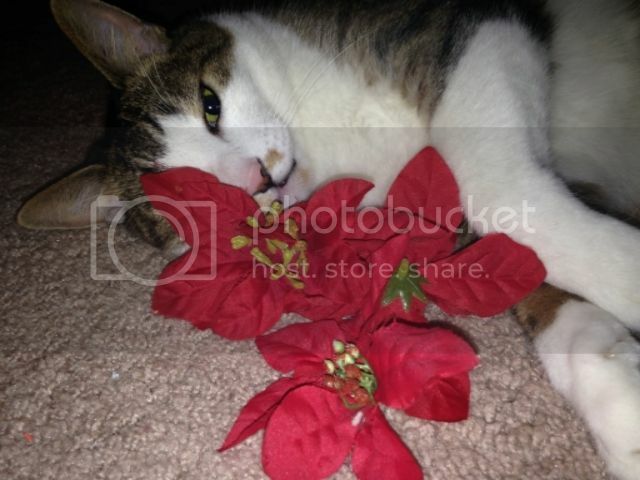 This is why I needed so many fake poinsettias. 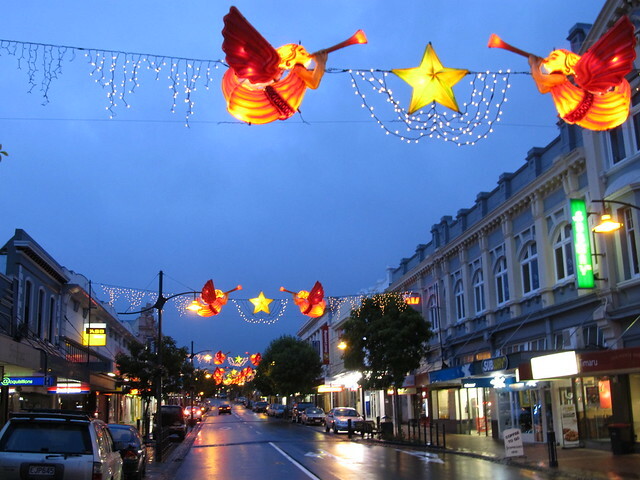 More from the Christmas decorations in Timaru, Christmas Eve 2015 (taken about 30 minutes ago).